“Doom was made by six dudes in six months. And that’s where we are again — it’s come full circle.” That’s Mike Wilson, co-founder of Devolver Digital, a game publisher that’s made a name for itself by finding the smallest and weirdest, yet most promising indie games out there. Whatever they’re doing, it works: Its list of successes is an indie gaming hit parade. Hotline Miami, Broforce, Hatoful Boyfriend, the new Shadow Warrior and dozens more. “Somebody once called us the Sub Pop for games,” he said, after noticing I was wearing a shirt from the famous Seattle label. “That’s probably the nicest thing anyone has ever said to me.” He declined to give the epithet any credit, but I’m using it in the headline just the same. It’s not an accelerator, but it’s not just a publicity agency, either. Like a good label, it’s a facilitator. The best and worst thing about independent games seems to be that the teams have often never worked together before, much less shipped a game on their own. Perhaps not applicable to everyone, but sometimes that’s the only way to proceed. The idea at Devolver is to prevent precarious positions like these from causing the premature death of what could be an awesome game. Canceled projects aren’t hard to find in the indie gaming world. 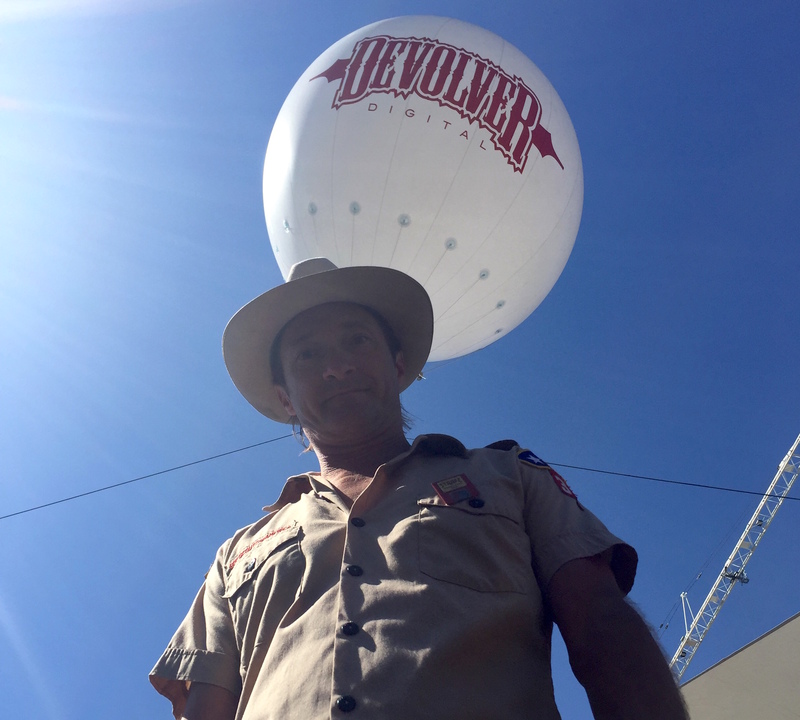 Wilson at the Devolver trailer park outside E3. Early efforts by Wilson and colleagues to unite independent developers fizzled — GOD Games (Gathering of Developers) and Gamecock had mixed success, but ultimately the field was retaken by gaming giants like EA and Ubisoft. And really, that balance of power hasn’t shifted — but it isn’t a zero sum game, Wilson pointed out. As gaming has grown, the number of people and dollars has increased on both sides of the equation. That means hundreds of millions of dollars in budget for huge franchises like Assassin’s Creed, but it also means millions of people willing to part with a few bucks for a game more tailored to their style. Nothing is stopping people from buying the new Call of Duty and a funky, $5 retro platformer like Downwell. Still, no one expected something as palpably insane as Hotline Miami to sell nearly two million copies. Either Devolver had their finger on the pulse, or they were in the right place at the right time. 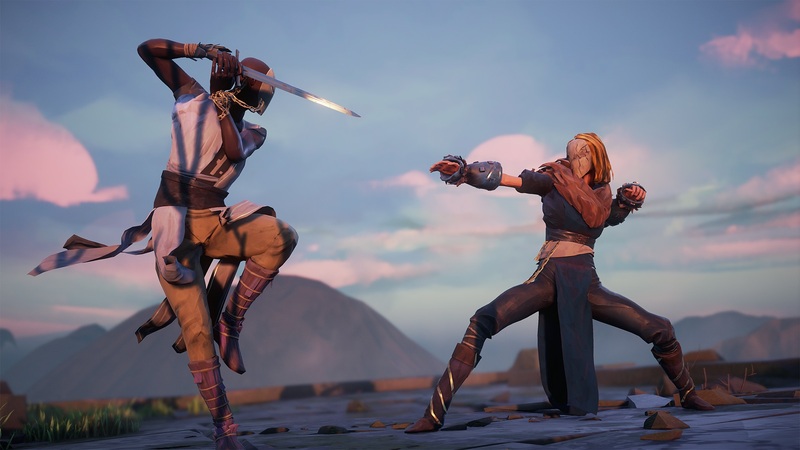 This promise has attracted people from larger studios to break away and make deals with Devolver: I played a demo of a terrific and highly original game called Absolver that’s being made by ex-Ubisoft developers. If they could have made it at Ubisoft, they would have — the resources of the company are immense, right? But creative control is one thing that’s in short supply when you’re dev #498 of thousands. Bigger projects are underway, too: A remake of the infamous 1990s FPS Shadow Warrior was enough of a hit for the team to double in size (now up to 75) and multiply the ambitions of the game for the sequel. But they seemed happy to stay on at Devolver, despite the publisher’s focus on microscopic projects. Wilson suggested a reason for that. A powerful, if profane, way to put it (we were both a little drunk). But Devolver really seems to be nothing more than a small group of like-minded people (there are only six full-time employees) attracting like-minded developers who all love each others’ games and never take themselves too seriously. It’s a refreshing alternative to the grim, samey world of the E3 show floor and its countless grizzled space marines.